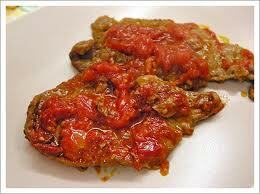 This is a typical Italian recipe coming from the rich region of Campania and a very tasty second course. Vitello alla pizzaiola has been made from patient and expert mothers and grannies in this region and in all the rest of Southern Italy with veal and a sauce of garlic, extra virgin olive oil and tomatoes sauce. You can found the recipe every where in the restaurant in this region if you are visiting Napoli. Or ou can prepare a gorgeous and delicious Italian dish simply following the recipe below. Place in a large pan the steaks of veal. After the cooking time which lasts for almost 40-45 minutes you can also cut the veal in smaller pieces, but for the start it is important that the meat are placed in the pan conserving its own integrity! Then proceed, cleaning the garlic and cutting it in small pieces.Not too small indeed but average small in size! Put over the meat the little pieces of garlic, add the chopped parsley and a small quantity of extra virgin olive oil. You ca now add directly the Parmesan and the tomatoes sauce. An important step is to heat the pan and add the water. Cook the whole meal at low flame for about 40 minutes. Allow the water to reduce a bit but not too much. Adds some other water in order to make it fluid and let the tomato melt with the oil and the meat juice to create a smooth and liquid sauce. Now your fantastic meal is ready! You can also brown the garlic in the extra virgin olive oil, then add the oregano and the tomatoes and then the meat. But we prefer the first version of the recipe. You can also cook a bit of pasta (tubettini pasta will be the best choice) and add the pizzaiola sauce to create a complete dinner with a first and a second course, as my grandmather used to do: “Non si butta via niente” (You don’t have to waste anything) of a good meal. This entry was posted on Sunday, September 2nd, 2012 at 5:25 pm	and is filed under Italian Recipes and Food. You can follow any responses to this entry through the RSS 2.0 feed. You can leave a response, or trackback from your own site.